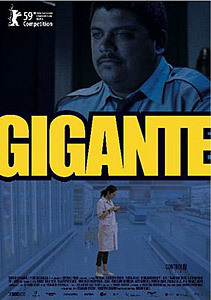 Gigante (Director: Adrián Biniez): Fabian Jara (Horacio Camandule) is the titular giant, working as an overnight security guard at a large grocery store in Montevideo. He spends his evening shifts watching security cameras of other night employees doing their jobs, including a crew of female cleaners. He gradually comes to fall in love with one, even though he doesn’t know her name. He begins following her from afar in the mornings, discovering her routines. On the weekends, he works as a bouncer at a nightclub, though he’s far too gentle a giant to really hurt anyone. Although he loves aggressive heavy-metal music, he’s far too shy to actually approach his crush. Instead, his stalker-like behaviour increases, although each time the film steers toward darker territory, Jara’s basic decency surfaces, preserving the light tone. Eventually, he discovers her name is Julia, and by the end a work-related crisis throws them together at last. It’s the slightest of premises, basically a “nerd gets the girl” story, but the performance of Camandule as the innocent “Jarita” (as his co-workers jokingly call him) is completely endearing. Leonor Svarcas as Julia is just the right combination of dorky and alluring to be believable as a woman Jara believes he might actually have a chance with. The film has the languid pacing and gentle humour that Uruguayan film is becoming known for, and it was a pleasure to recognize Juan Andrés Stoll from Hiroshima (review) in a small role. Though it’s not great cinema, this is a perfect festival film, a crowd-pleasing slice of life that for me personally was a welcome respite from the steady diet of abusive families, suicide, disease and obsession I’ve been watching so far at this festival. This entry was posted in DVD Clubs, Film Festivals, Film Movement, TIFF and tagged #tiff09, uruguay. Bookmark the permalink.